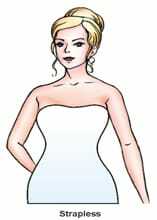 Sell and buy second hand wedding dresses online. 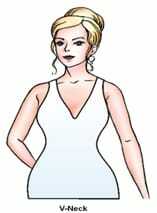 The right neckline can make a difference between a wedding dress that flatters and one that doesn’t. Especially when you’re looking for your dream second-hand wedding dress online, it’s very important to choose a wedding dress with the proper neckline according to your body type as some necklines are more flattering than others. The neckline is different on the left and right of the bodice. Often described as a one-shoulder design. This wide neckline sweeps across collarbone to the edge of the shoulders. The front and back panels are joined at the tip or can be separated by a thin strap. The halter features straps that wrap around the neck and generally has a low back. 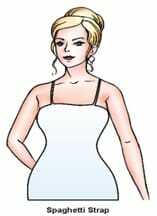 The design emphasizes the shoulders and is best worn with minimal or no bra. It can make you look taller if petite. This neckline sweeps across the chest and rests on the shoulders. This style will highlight your shoulders and collarbone. Similar to an off the shoulder style but made with more fabric. The portrait neckline is characterized by a wide, soft scoop from the tip of one shoulder to the tip of the other. This classic U-shaped neckline is usually cut low and continues its rounded feature at the back of the dress. 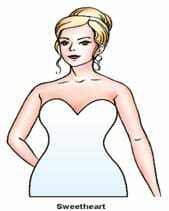 A very popular style when brides look online for second-hand wedding dresses for sale. The neckline is usually straight supported by thin delicate straps. Often these are detachable. Spaghetti straps that can create a frame for a pretty neck and can minimize big shoulders. Another very popular style that you can look up while making a purchase from an online website with pre-owned wedding dresses. This style features a straight or shaped line sweeping across the chest. As the name indicates, the neckline is strapless. The bodice is usually bonded to provide support and help maintain the dress shape. This low neckline resembles the top half of a heart and incorporates a high back. This style is ideal for large chested women. The second most popular style among brides after strapless wedding dress on sale. This neckline features a V-shaped that is ideal for brides who have a medium chest and want their wedding dress to accentuate cleavage.